First off, I want to thank the two dozen-plus people who sent well-wishing emails as I fight through my illness, now in its second week. The oupouring of support is touching, with everything from specific cure suggestions, to simply hoping I “get well soon.” To that end, I’m happy to say the worst has passed – and thus, that by this time next week, I expect to be fully recovered! Secondly, let’s just say that, despite yesterday’s unprecedented market rigging – of stocks, bonds, and crude oil, in a blatant “powers that be” attempt to prevent Wednesday’s carnage from morphing into Thursday’s avalanche, we (Precious Metal holders) are very clearly, back in the driving seat. Despite the “Dow Jones Propaganda Average” being supported via a prototypical “dead ringer” algorithm (note the bottom at exactly the Fed’s 10:00 AM “open market operations”); and yes, the five “hail mary’s” in the Chinese market, enabling it to close barely positive; all that still remains of the fraudulent-from-the-start “Trump-flation” meme is dead. And right behind it, any (PPT-fostered) beliefs that the Fed, or any Central bank, will do anything in the foreseeable future other than inflate – or in some cases, hyper-inflate. Most tellingly, currency markets are again in a state of crisis – led by the “tell” of plunging emerging market and “commodity currency” nations; such as Brazil, whose own political scandal caused its stock market to be halted down 10% (it didn’t re-open today), whilst the Real plunged by an equal amount. Which oh yeah, caused gold to rise by that amount, as 200 million Brazilians increased their already healthy fear of “the worst-case scenario.” And trust me, if you live in Brazil, Venezuela, Puerto Rico, or any nation currently enduring said scenario, the odds of PROTECTING yourself with Precious Metals just dropped from slim to none. 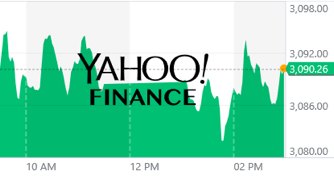 Despite the PPT and various Cartels’ shenanigans; not to mention, the “lie to end all lies” that was the April “Philly Fed Index”; and the sketchy “evidence” that Donald Trump did not obstruct justice in the Michael Flynn investigation; interest rates continued to plunge toward their post-Election lows – where they remain this morning, despite the relative market calm. And by the way, here are some of the PiMBEEB headlines the “evil Troika” of Washington, Wall Street, and the Mainstream Media have ignored this morning, if you think global fear of where things are heading is going to reverse anytime soon. As I write early Friday, gold and silver – despite the fifth “2:15 AM” raid this week alone – have recouped half of yesterday’s losses; with gold, at $1,252/oz, healthily above its 200-week moving average of $1,239/oz, having bounced strongly before it even got close yesterday. And silver, at $16.75/oz, as fundamentally strong as ever, and historically undervalued. I haven’t spoken recently of the gold/silver ratio – particularly, as in recent years, both gold and silver have been so blatantly, historically undervalued. That said, particularly since Election Day, when the Cartel has gone berserk manipulating markets of all kinds, silver’s relative underperformance has been dramatic. This, at a time when the global economy has plunged, with countless currencies following suit – not to mention, as the “Trump-flation” trade ignited a base metal bubble that silver decidedly did NOT participate in. Meanwhile, both political (no matter where you live) and geopolitical risk have measurably increased; and oh yeah, it was confirmed that both gold and silver passed peak production levels in 2015, with no possibility of a material rebound for the foreseeable future. This, as above-ground, available-for-sale inventories have continued to dwindle – like COMEX registered silver, which has plunged to just 33 million ounces, worth a mere $550 million; from 71 million ounces in early 2015, and the 86 million-ounce-peak, just before the 2008 financial crisis. 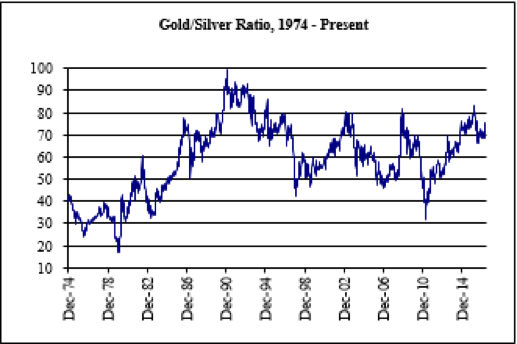 In other words, not only is silver’s supply/demand balance more bullish than at any time in the post-War era – certainly, since the abandonment of the gold standard in 1971 (let alone, given its exploding industrial “use cases”); but the monetary reasons to own silver have, unquestionably, never been more urgent. 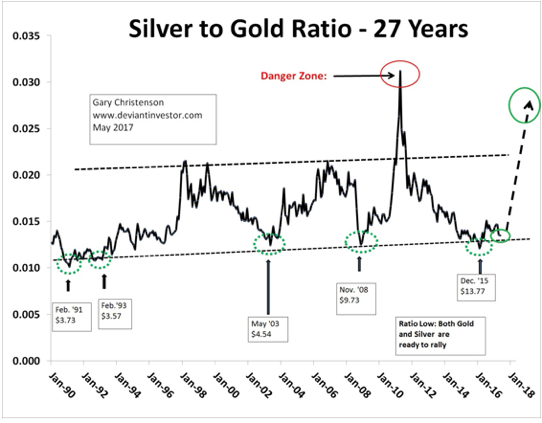 Gary Christenson yesterday published this chart of the silver-to-gold ratio, depicting how it is trading at the low end of its trading range of the past 27 years – with its last “interim peak” occurring the day of the “Sunday Night Paper Silver Massacre” in May 2011. And one footnote to add, regarding said ratio in late 2008; which is, if the physical price that prevailed during that period of historic, Cartel-induced shortage were utilized, the silver-to-gold ratio would also be shown to have reached the 2011 highs. Adding to the historical record, is a chart I have maintained throughout my 15 years in the Precious Metal sector – depicting the (in this case, gold/silver) ratio going back to the COMEX’s 1974 opening. You know, when the Cartel blatantly colluded to use this fraudulent paper exchange as a means of suppressing physical demand and prices. As you can see, the gold/silver ratio traded much closer to its historical average of 15:1 before the COMEX worked its magic on the “canary in the silver mine.” Which, I might add, was based on the historic silver/gold production rate, which has since plunged from 15:1 to around 9:1. Over the past two decades, the only times the gold/silver ratio has traded in the 75-80 range were the peak of the dotcom economy in the late 90s (before the now 17-year PM bull even started); the aftermath of the Cartel-fostered post 9/11 paper PM crash; the aforementioned paper raids at the onset of the 2008 financial crisis; and NOW. The odds of the gold/silver ratio materially declining in the coming years is as high as at any time in recent memory – yielding a significant, potentially historic silver investment opportunity, given the aforementioned political, economic, mining industry, and monetary fundamentals. If you have any questions about silver purchases, swaps, or storage, we humbly ask you to call Miles Franklin at 800-822-8080, and give us a chance to earn your business. I assure you, you’ll be well taken care of!